College generally ends up being fun by the end, but at the beginning it can be pretty rough. There are all manner of people, groups and cliques that one has to find their way through to discover one's self. Work in a pandemic and things get a little dicier as they do in Lazaretto #1 from BOOM! Studios. The issue is written by Clay McLeod Chapman, illustrated by Jey Levang and lettered by Aditya Bidikar. After a pandemic strikes, a dorm complex at a small American college is quarantined with all of the students trapped within. What first starts out as youthful freedom from authority soon devolves into a violent new society-it's Lord of the Flies on a college campus. 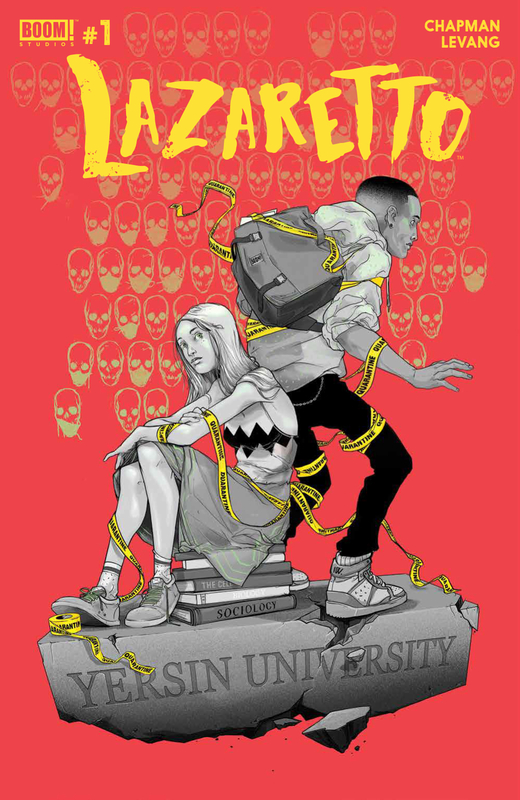 Chapman offers plenty in Lazaretto #1 that makes it feel at least somewhat plausible in the sense that the college campus feels realistic. The two main characters Charles and Tamara are depicted as navigating the new realities of being new students at a college and Chapman uses this as the backdrop for what unfolds by the end of the issue. There's also a ton of dialogue throughout the issue that gives the characters room to establish their personalities; these personalities are seemingly disparate but the desperate circumstances bring them together. Once the setting and players have been introduced, Chapmen gets to work in setting up the premise of the story that revolves around a pandemic. The pacing definitely ramps up in this regard as Chapman starts things out slowly before getting into a full-throated outbreak situation. Levang relies on an illustrative style that feels as uneasy as the students faced with the sickness do. Characters are drawn with a loose attention to physique, but Levang still manages to give each character plenty of room to be unique and better reflect the melting pot that is college. Peppered throughout the new groups and clubs that Charles and Tamara can join is evidence of the illness which Levang illustrates with pretty gory effect. It's not that Levang lets things get so graphic that readers will be turned off; rather, there's an emphasis on the toll such an illness takes on the body in the form of blood, vomit and tears. These effects are further emboldened by the fact that much of the book feels like it's colored in pastels that add a sense of brightness to an otherwise dreary situation. Lazaretto #1 is an interesting first issue that upends the traditional tale of freshmen going to college. Charles and Tamara are in the thick of learning how to be adults while having to deal with an outbreak of epic proportions. Chapman has a story he wants to tell although there are still some outstanding fundamental questions that still need answering, such as why the students don't trust the authority at the school. Levang's illustrations provide the right level of levity for an otherwise dramatic book in a way that doesn't undercut the underlying message and story. Lazaretto #1 is a book about people finding themselves as individuals as well as society as they band together to survive. Lazaretto #1 is available now.